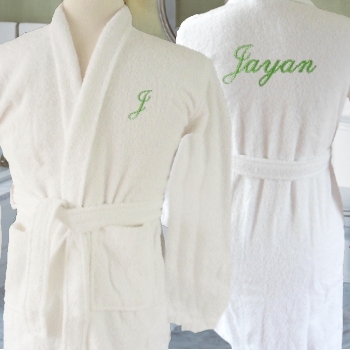 Childrens white bath robe personalised for boys or girls size to suit ages 6-7 years. Childrens white bath robe personalised for boys or girls size to suit ages 6-7 years. Soft childrens robe that is comfortable, warm and easy care and quick drying. Kimono style terry towelling robe. Fits approx ages 6-7 years. This V.I.P kids robe will be an extra special gift with embroidered personalisation.